I think we've all fallen down a "What I Eat In A Day" Youtube rabbit hole at least once within the last year, and as a personal huge fan of seeing what other people choose to put into their bodies, I was all "Hey! Maybe I should do one of those." so skip ahead a few months and here I am, bringing you a somewhat realistic What I Eat In A Day post. Whoop. Before we get started I want to add a quick note to mention that I apologise in advance for the photos that are lacking (see: dinner), I still rely heavily on my phone's camera and that doesn't mesh well with low lightening, so.. yeah. Sorry! Also all the ingredients mentioned are portioned to one serving, so you may want to double, triple or quadruple the written amount if you're feeding more than yourself. Enjoy! 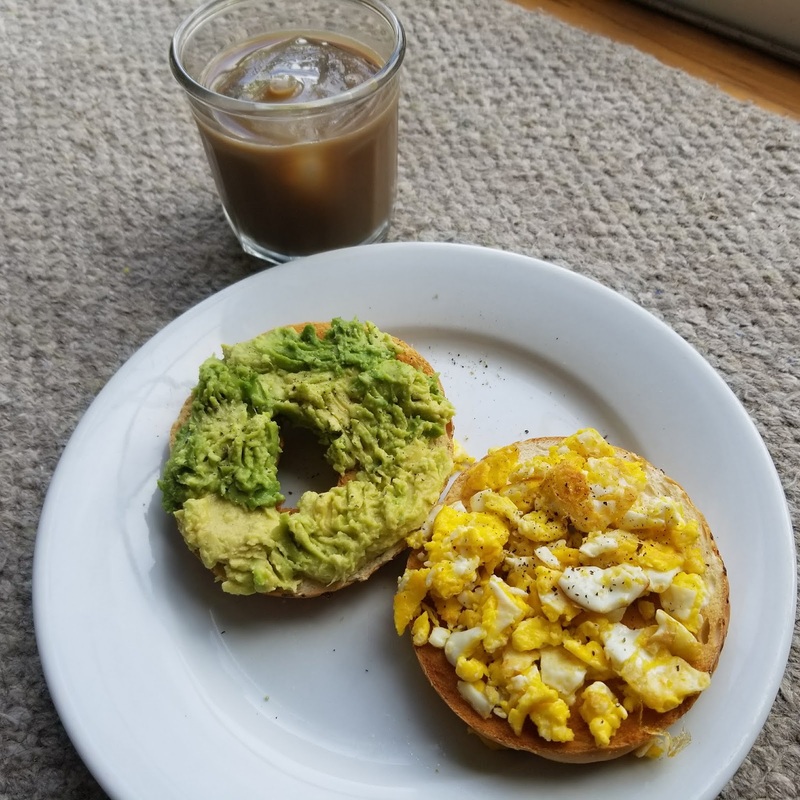 Okay, I'm not literally eating Instagram but I think egg and avocado bagels are now an Instagram staple. I think every blogger has uploaded a variation of this meal. I'm usually not a lover of eggs, but alas, some days you just have a craving and this was one of those days. To go alongside breakfast me and my husband shared some premixed protein iced coffee that we got on offer. I can't remember the exact brand, but it was surprisingly good. How to: Start cooking your scrambled eggs as your bagel toasts. Mash up your avocado in the skin and then plonk (yes, that is a scientific term) it on one side of your now golden bagel, proceed to do the same with your eggs on the other half. Top the green side with pepper, salt, and dried onion. Trust me, it makes a huge difference. If you're feeling crazy, put some Tabasco on your eggs and get ready for a flavor explosion. This is one of my go-to speedy lunches if I'm busy but wanting something fulfilling. 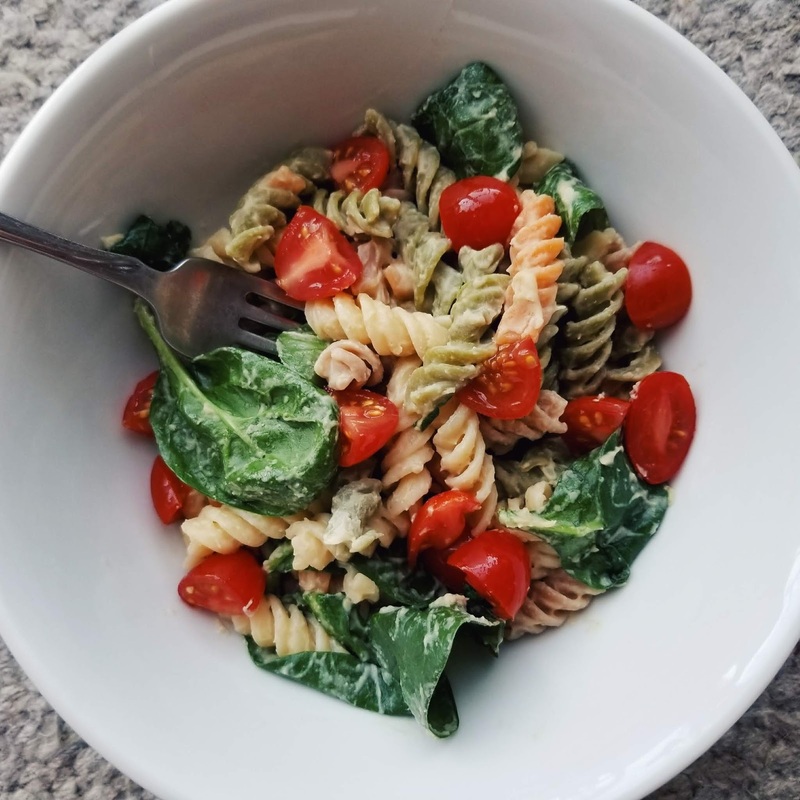 Though you can use your standard pasta, I favour using tri-color rotini or lentil pasta, there's no particular reason behind this other than my personal preference. The thing I love about this is how versatile it is. You can easily switch things up by changing the veggies, or hummus flavour. If you aren't veggie, you could mix in some chicken or whatnot. If you want a heartier variation, you could add mushrooms and broccoli. How To: Cook up your pasta to your own liking. Drain. Transfer to bowl and mix in a hearty scoop of hummus, cut your tomatoes in half, add them and a good handful of spinach to your bowl. Enjoy! And this humans, may be the most unattractive photo of food I have ever taken or seen, those nighttime lights just don't work well with my camera. At all. (Oh and I apologise for that Wish-like title. So many words.) 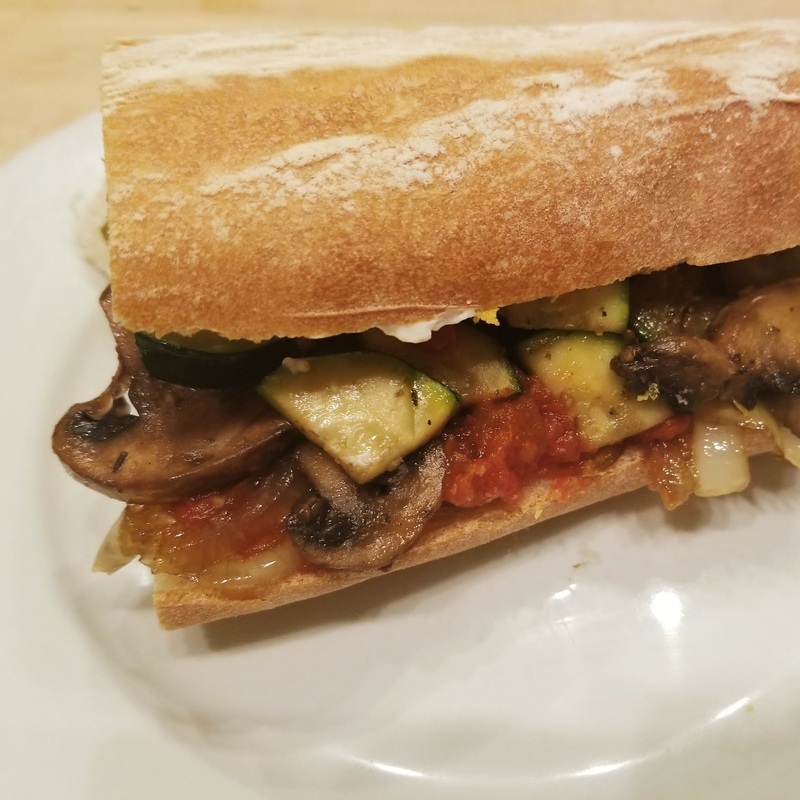 But I promise you, this sandwich is as delicious as it is indulgent! I believe it's a variation of a recipe I stole from Lea Michele, but don't hold me to that. As with all of these meal ideas, you can make this as simple or as fancy as you want. This is just my chosen method. Also this is one that can be a little tricky to time correctly, but I usually do the recipe in the exact order I'm writing it down and it takes no longer than 20-25 minutes. How to: For the onions: Heat up a little oil in a frying pan, add your onions and 1 teaspoon of brown sugar. Mix together and let it cook on a low heat until your onions became translucent and have an almost sticky appearance. 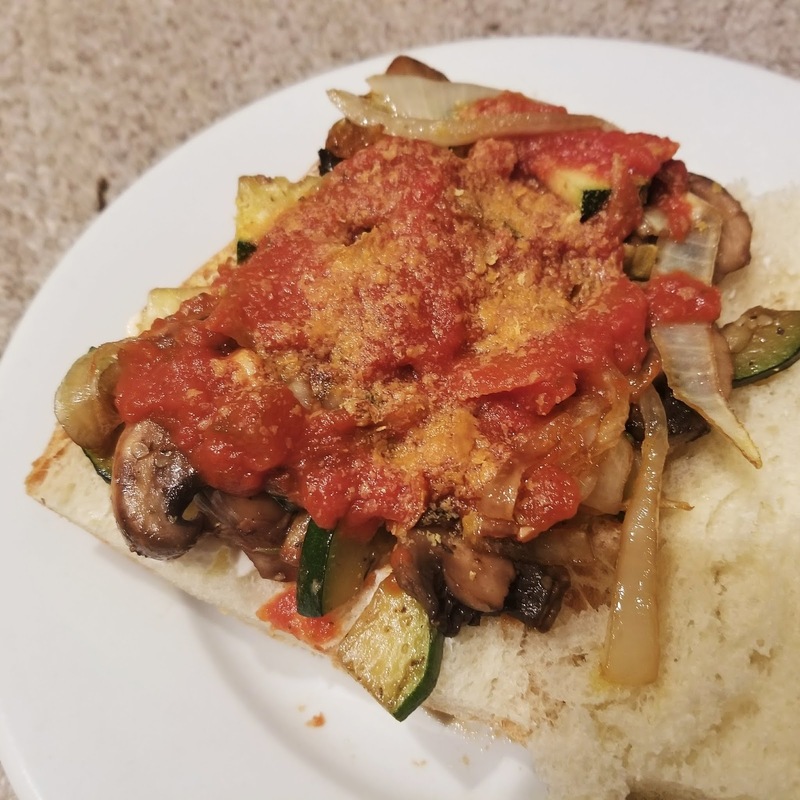 In a pan or the microwave, heat up your marinara sauce and slather your bread in a decent amount of cream cheese, though optional, I highly recommend the spread as it gives the entire sandwich a creamy element. And now it's time to pile your bread with all three elements and enjoy. And there we have it, my first What I Eat In A Day. It may not be the most fancy or adventurous but these are some of my trusty fallback meals that never steer me wrong. Would you try any of these, or do you make something similar? Let me know!